NEW DELHI, INDIA: Tracking customer calls and database management is now made easy with the launch of the MyOperator mobile app. This app is a solution for business owners, apprehensive about missing out on business calls while they are away. It eliminates the obligation of being physically present in a business place to attend incoming calls. The app enables businesses to track missed calls, add to the customer database of businesses and manage them anytime, anywhere through a smartphone. Additionally, it also introduces a concept of re-marketing to callers in a virtual call management system. This addition makes enterprises and SMBs more lucrative as they have their hands on a large database to be re-used for higher conversion rates. This mobile app is a supplement to the primary product MyOperator, which is a virtual call management system built on the cloud that aids SMBs and bigger enterprises to manage their calls without the need of incorporating any hardware or software setup. “We understand the importance of missed calls and the intensity of how adversely a call missed could impact small and medium businesses as well as big enterprises. Therefore, we are aggressively working towards enhancing our call management services and empowering businesses with cutting-edge technology for its growth,” said Ankit Jain, Founder and CEO, MyOperator. My Operator app lets businesses organize their communication by tracking and managing every call ever made, received or missed by the executives, team members and partners at one place. The application at present is available only for Android users. The users can access the customer database in a downloadable format on the dashboard of the app. It has all the call logs and call database which can be used for re-marketing through SMS. The caller’s database can also be synced with various CRM solutions viz. pipedrives, zoho, salesforce etc. The caller database of a company starts building the moment the app is launched into the system. It becomes more and more comprehensive as other team members join the business account. MyOperator is a one stop shop for managing all business calls and SMSes. The app can also track the calls missed in the follow-up section and remind users to connect with the callers until the contact is made. 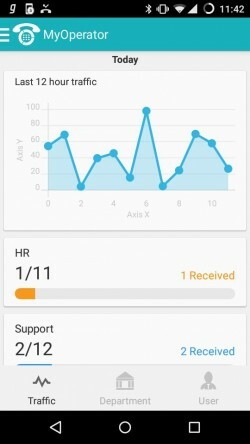 “In this age where mobility is one of the most sought after characteristics in everything and people are driving their businesses through their mobile phones, this application is an effort to induce flexibility and movement to our fixed call management system built on the cloud,” added Ankit. Enterprises with bigger teams can utilize this app to track calls of all team members at one location. This feature aids every person associated with the business to keep a track of calls missed by another associate. Companies can also track calls of their sales or support team sitting in-office or on-field. Bigger enterprises can upgrade their account to MyOperator premium or Toll Free for more benefits and features at significantly low charges. Established in the year 2013, MyOperator is a call management system on the cloud, which helps SMBs and bigger enterprises, manage their calls without any hardware or software installation.